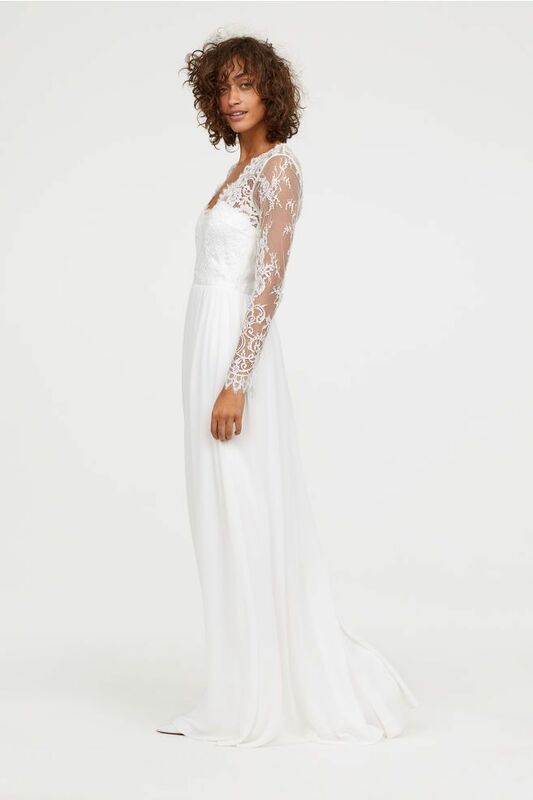 While fast-fashion retailers like H&M or ASOS may not necessarily be the first place you had in mind to purchase your dream gown from, the latest stunning bridal collections cropping up at these affordable stores just might convince you otherwise. There is a rise in the variety of silhouettes, fabrics, and great-quality frocks on the market right now to suit every type of bride these days, and most importantly, they come with comfortable price tags—undoubtedly a huge financial weight lifted off the shoulders of brides-to-be already confronted with the astronomically high costs of planning a wedding. You'd be forgiven if you mistook this for designer. Lace lovers, this one's for you. You get to really play up the accessories with this modern and flattering silhouette. We love this sleek ivory option. Stand out in statement sparkles. Major Meghan Markle reception dress vibes here. You'll clearly get use out of this one well after your big day. How stunning is the open back? You'll be thankful for the side slit when you're ready to bust some moves on the dance floor. Intricate embroidery adds a luxurious touch. For those who want something outside the traditional wedding-dress box yet still want all the romance, this divine lace jumpsuit is the perfect option. The beaded bodice and square neckline make this unique. Crop tops are a huge bridal trend for 2019. Shop the matching Campbell Skirt ($550). No need for a lot of accessories with this striking high-neck stunner. We love this wrap silhouette for a beach or laid-back setting. Up next, the biggest wedding dress trends of 2019, according to a bridal expert.